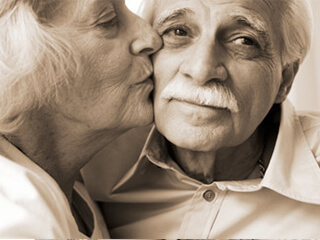 Alzheimer’s or Alzheimer’s Disease is a chronic neurodegenerative disease. Its onset is usually after the age of 60-65. The causes that lead to Alzheimer’s are poorly understood. Genetics, head injury, depression, hypertension are some of the factors that are being studied. There are currently no treatments available to slow down or stop the development of the disease. Affected persons have to be cared for and require assistance to perform everyday tasks. Most noticeable initial symptoms include short-term memory loss, which creates difficulty in remembering recently known facts or information or difficulty in acquiring new information. Apathy, or a lack of feeling, emotion or concern for the world around, is seen at an early stage and continues throughout the disease. They can be irritable, show aggression or resist care-giving. Lack of attentiveness, inability to think or use judgement, difficulty in execution of movements, losing command over one’s language — these symptoms greatly affect the way the patient, the caregiver and those around them interact. The caregiver needs to educate family and friends regarding the changes that have occurred or are to occur to the patient in the days and months to come. When the disease progresses, patients may not recognize even close relatives or even immediate family members. This can create emotional stress within the family and can affect the way they interact with the affected person. Sundowning (increased behavioural problems occurring in the evening with sundown) is seen in persons at an advanced stage of the disease. They can be increasingly confused and upset. Tremors might increase. Restlessness can interfere with sleep. This means the caregiver who monitors the patient also needs to keep odd hours and this can take a toll on them. One of the risks associated with Alzheimer’s is wandering. Wandering can be dangerous for the patient as they might be lost with no way to find their way back, they might be inappropriately dressed for the weather outside, or can get into an accident. Caregivers have to constantly be aware of their patient’s whereabouts. They might need to restrict the limits to which the patient can move about unattended, like within the home or a monitored yard. Or they might need to be with the patient during the entire duration while the patient is outdoors or in unfamiliar surroundings. This calls for the complete attention of the caregiver, which is no small task. Motor activity might become less coordinated, hence, the risk of falling increases. Making the surrounding safe and accident-free is an important concern. The home or the place the patient visits often needs to be made safe and appropriate for the affected person. Everyday activities like hygiene, grooming, dressing, eating and exercise need to be carried out in a set routine to bring order in the patient’s life and to make caring easier and systematic. If the caregiver is a family member, remember to give yourself time. Rope in another family member or a trusted friend to take time off for your personal activities or to run errands. Enlist a professional caregiver if you need to be at work. Find out about good adult day care facilities close to home that will look after your loved one when you cannot be present. Even with all the care and attention you give to your loved one, remember that they may respond negatively or with indifference, which is unintentional. Manage Alzheimer’s one day at a time.